This is my first ever dress from Bonne Chance Collections; I discovered this amazing website a few weeks ago and posted about it here. It has the most adorable, beautiful and sweet dresses I’ve ever seen; the designs are so special and like those from my dreams. I wish I could build up the whole collection of unicorns, kittens, strawberries and stars. 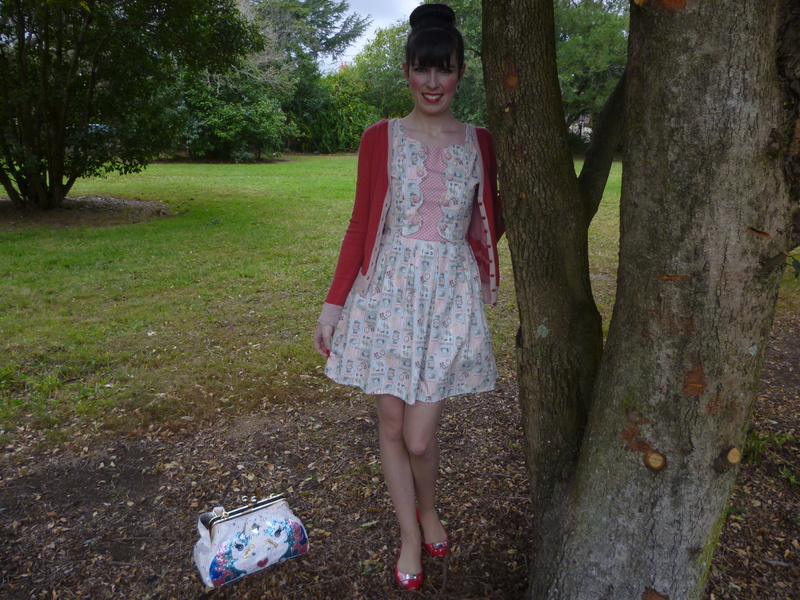 This particular dress has the print of little shoes, handbags and hat boxes. I love it so much! The dress runs a little large and doesn’t come in an extra small so I’m more comfortable wearing a cardigan over the top since the dress isn’t particularly tight fitting. That works well in the winter time anyway. 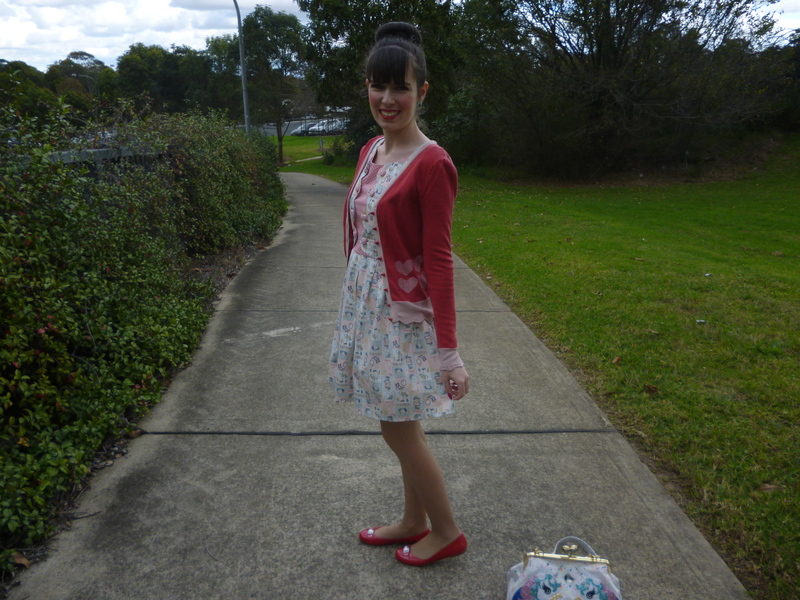 I had the desire to wear my heart print cardigan; I haven’t worn it in ages. It’s so fun and happy to wear. I adore the heart print buttons too. I often don’t know what to wear it with but, like I did with this look, I’m going to create more outfits involving pattern mixing. The cardigan is also the perfect match to my Marc by Marc Jacobs flats. Ever since I receive my Marc by Marc Jacobs mouse flats as a gift last year which I posted here I’ve been completely in love with Marc by Marc Jacobs flats of all varieties. Not only do they look amazing, they are the most comfortable shoes ever. I’ve bought two pairs since and both at very reasonable prices; if you search hard enough there are some great deals out there. The unicorn bag adds to the girly, pretty and adorable theme. It’s so great to be back at work this week. I feel much more comfortable there than at college. I’m very busy at work at the moment, I’ve been given some extra responsibilities which is a great opportunity. But it’s exceedingly hard to balance law college and full time work which is why I keep wishing for college to end. Although there have been some challenging and not so positive times at work, this job has overall been the best thing to ever happen to me. I am so grateful for how much of a life it gave me when I literally felt like there was no other point to life. On another note, at work we have a world cup draw and I have been assigned The Netherlands as my team. I haven’t ever watched much of the world cup in past years but this time I’ll probably take a moderate interest since he have this fun game at work. I need The Netherlands to win some games so I can get prices at work! This entry was posted in Alannah Hill, Marc by Marc Jacobs, Marc Jacobs, Modcloth, Outfits, Uncategorized. Bookmark the permalink. So pretty, I love everything about this outfit. This dress is the cutest thing ever! It looks like it was meant to be worn by you with the adorable print and sweet detailing. I just love it! That dress is simply incredible – can't believe how cute it is! 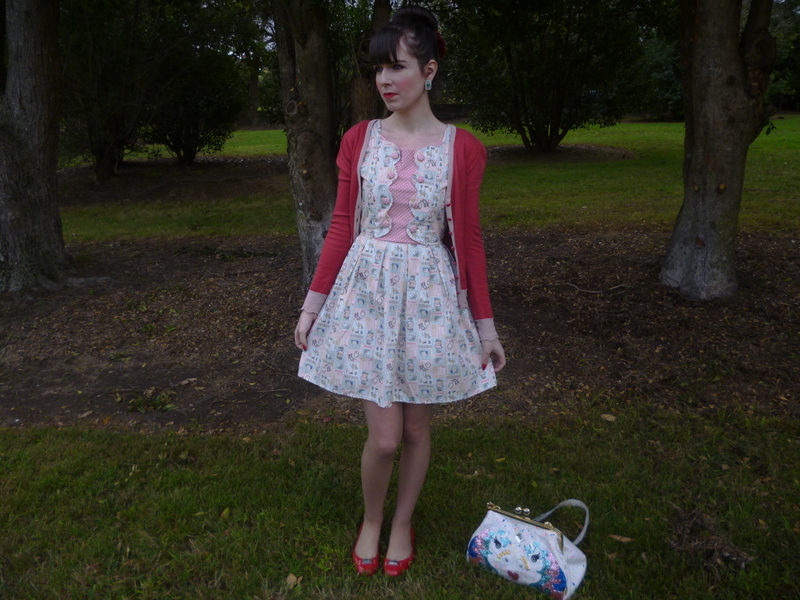 I do love how you wear these fantastic dresses, Imogen:) The print is just adorable. And I hope Netherlands win some games for you:) I don't really follow World Cup….sigh…. 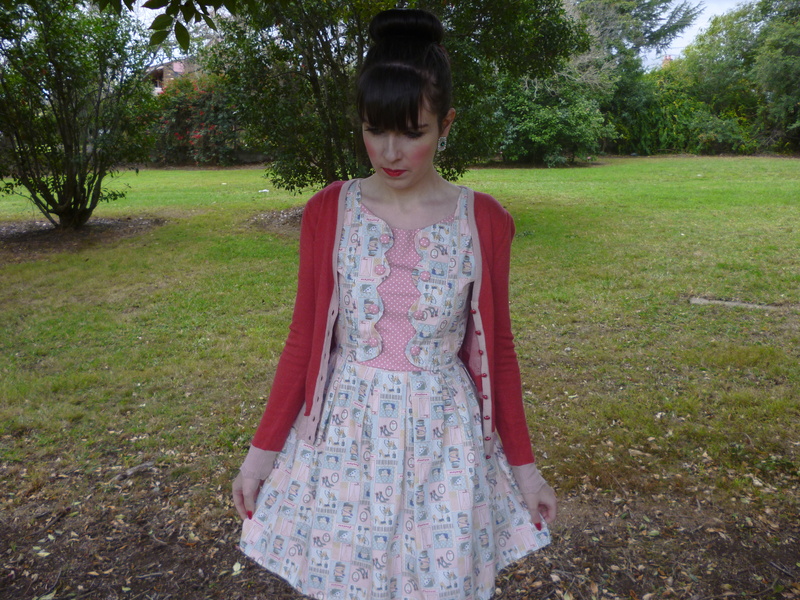 Such a pretty dress – the print and colours are stunning. Here you really look like a princess from a beautiful fairytale :)! So cute! Love this outfit, beautiful colors and silhouette! That dress is so pretty and so is your bag! 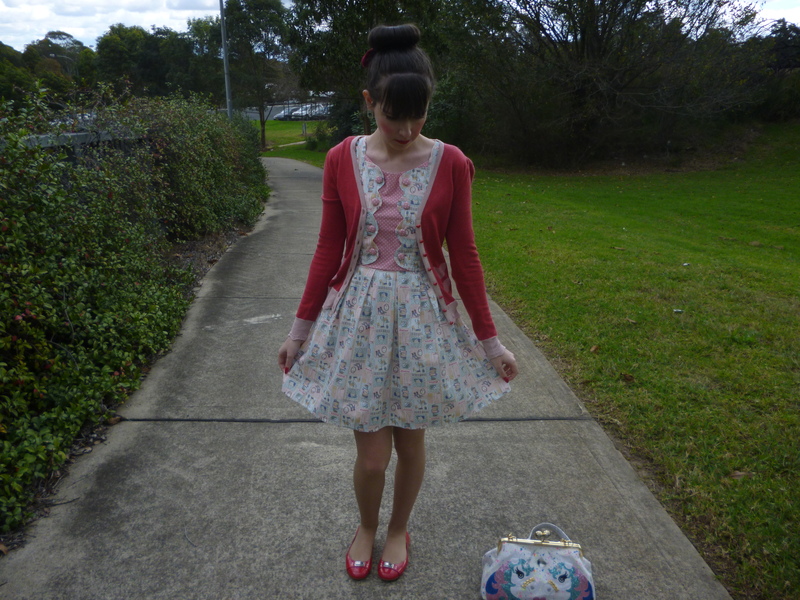 This is another adorable dress+cardigan combo. Love both of those pieces. 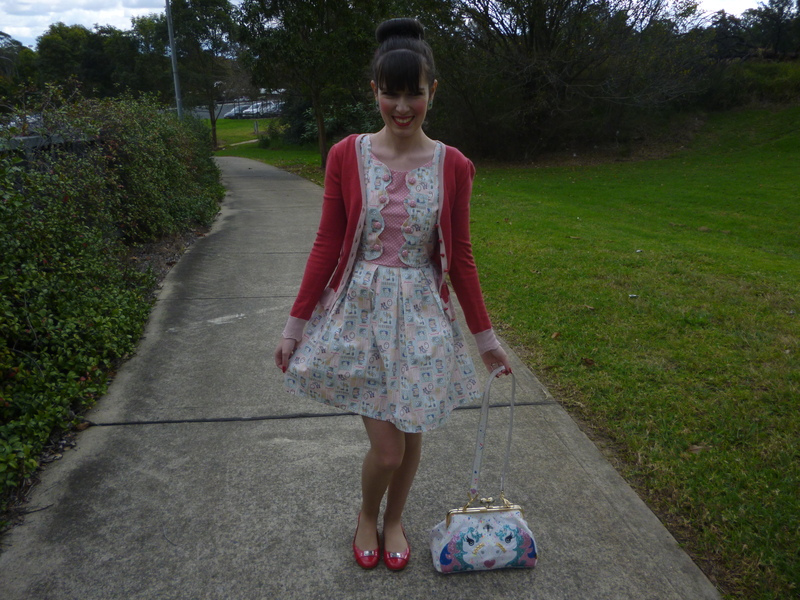 And thanks Imogen for linking up the gorgeous Teal+Floral Outfit with us. You're great. Your style is great. Hope you enjoyed the weekend. ❤ Ada. That dress is so super adorable, I love the shape and print, it is so you. This dress is very lady-like, and it's nice to dress like this every now and then. You have such a wide variety of style – girly, fun, elegant, classy, whimsical……..and that's what makes you so special, Imogen. Have a fun week, and it's so nice to hear that you feel comfortable at work. I don't hear that too often. This dress is so cute on you! I have a few BCC dresses too. I love their prints! I hope you get the routine of work/school down. That has to be really difficult! I'll have to check out more dresses by this brand! This dress is lovely and I really love that cardigan too. It's perfect for the dress! Hi girly! I love love this outfit, the dress is beautiful but my favorite part of the look is your bag.. it is absolutely GORGEOUS!!! I'm glad to find someone else that has a full time job, goes to college and blogs 🙂 I'm right there with you sister! it gets hard at times but I love every minute of it! This dress is sooo cute!! You look adorable! Sooooooooooooo glad to see your comment dear Imogen. This outfit is so pretty, once again I love your preppy style!!! Oh this dress is adorable! I love the scalloped bodice and the colors are just so beautiful on you! What a fun and unique dress. Glad you're enjoying work now, I hope your classes go easy on you so it isn't so stressful. Working and going to college at the same time is so challenging! I love how fresh and fun your style is! Great look and even better bag! love your red shoes..so cute…and the bag is really nice…I also like those green earrings. What a pretty dress- I love the details! I also love the pattern mixing!